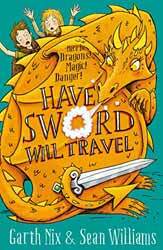 Have Sword Will Travel (2018. 295 pages) is the first book in a new series of young adult fantasy novels, written by Garth Nix and Sean Williams. For parents considering the suitability of the book, there are no offensive words, but there is mild peril, danger and violence. In fairness to a story involving magic swords and dragons, it would be difficult to tell the tale of two young characters that set out into the greater world to right wrongs without some violence. The magic sword that the two find is called ‘Biter’, although what the rest of his name is is a bit more difficult. He has lain at the bottom of the river for a couple of hundred years dreaming of eels and so has become a little amnesiac. The authors have thankfully kept the magic elements of the book to a minimum, mostly consisting of magic swords and dragons. This is as it should be because the focus of the book is centred on the friendship between Eleanor and Odo and how they are stronger together. The book is a straight adventure, so the general plot is them moving from village to town, righting any wrongs they find before moving on to the next adventure. There is an overall villain, but it is not who you may think and Nix and Williams do a good job at pulling all the threads of the novel together to produce a satisfying end. It’s a light fantasy and a quick, fun read.